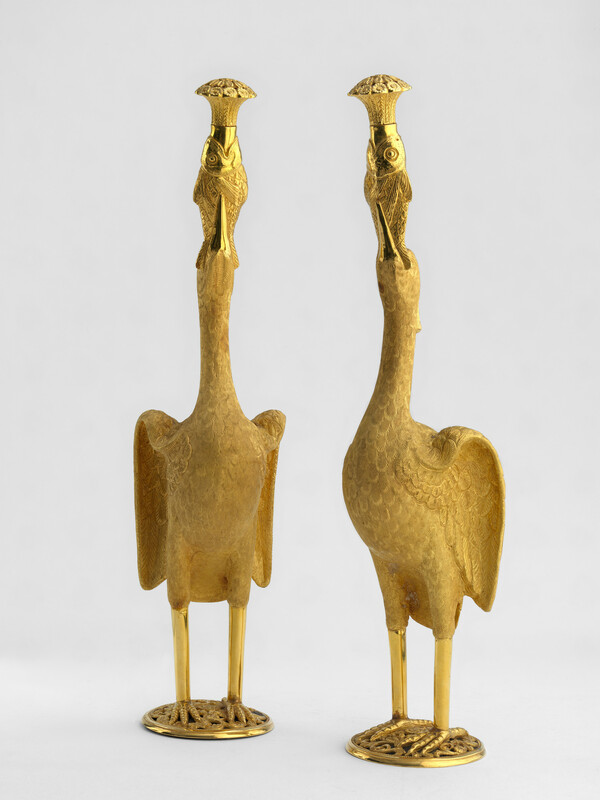 A pair of gold rosewater sprinklers modelled on cranes. Rosewater was offered at the beginning of formal meetings to welcome visitors within Indian court. Each crane holds a fish in its beak with a bouquet of flowers issuing from fishes mouth forming the sprinkler. Elaborate containers such as these were designed by Indian craftsmen to showcase local craftsmanship or motifs. The modelling of these sprinklers was inspired by the legend of two rival craftsmen, Gangu and Nandu, working in the court of Jayasimha Siddharaja (c.1094 – 1143) in Anhilpur, modern-day Gujarat. Both goldsmiths were invited to partake in a contest of skill by the ruler. Gangu produced a fish made of gold that could float and move in water. In response, Nandu produced a crane that pecked at the fish causing it to drown and thus won the competition. Nandu later incurred the wrath of the ruler and was banished from the region and settled in Cutch. This tale appears to have inspired later metalworkers of the region.